It's Wednesday March 13 and time for another Whimsy Challenge. WE have some wonderful creations from our Digital designers, click here to check them out. 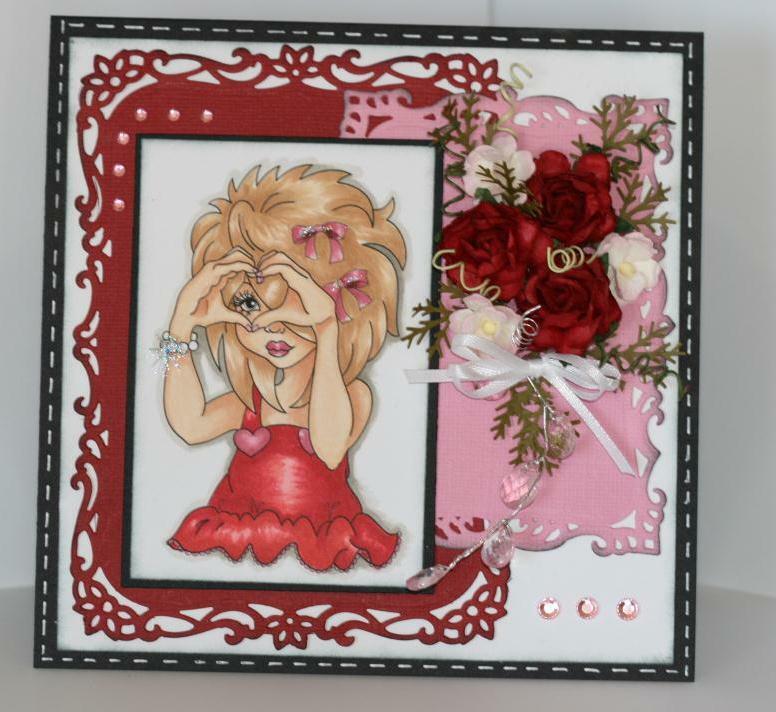 You don't have to use a Whimsy image or make a card, it can be any creation. It just has to have real or faux stitching on it . Easy enough right. We have three prizes to give away to the lucky winners. So I'd love to see you create a great project and enter it on the Whimsy Challenge blog. This is my card for this challenge, I had a few issues with the real sewing thing. I got this little paper sewing machine, just for little projects like this. I've had it for ever and never used it really. My daughter always did she had me help her with it when she used it. Well I dug it out of my cupboard to use for the stitching. I seriously couldn't get it to work. I made me crazy! It just wouldn't stitch anything super frustrating. So I have to sit down to figure it out, but in the mean time .... I just decided to do faux stitching. But I will master the use of that for next time, this time my card was just taking way way to long. I made this card using a super cute image from Whimsy Stamps by designer Marika Collins called One Heart. I love this little image it's adorable, I never put a sentiment on it . I think you can give this card to anyone and have it be very self explanitory . A closer look at the image and the bouquet of little flowers in the corner. 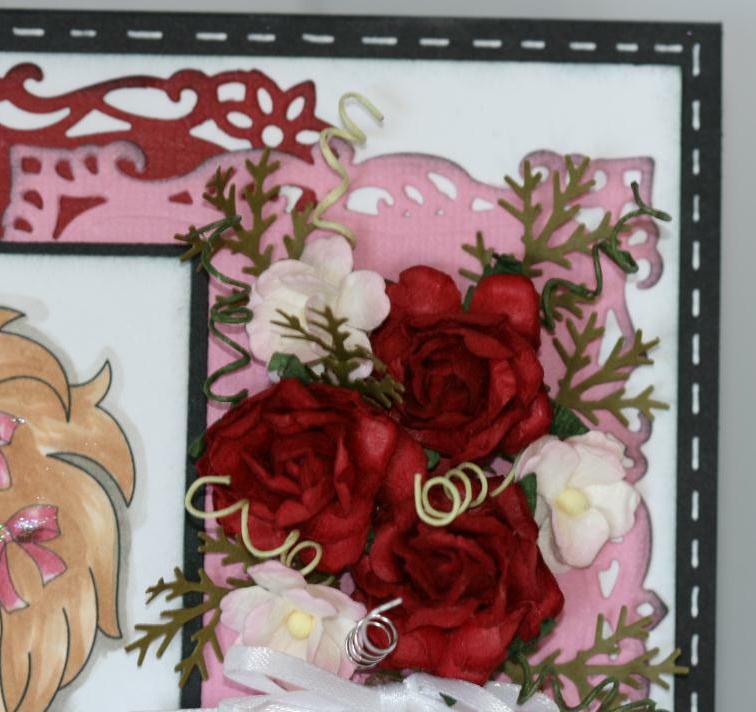 A little look at the faux stitching that I did around the outside of my card. Supplies: Bazzill cardstock, White gel pen, Whimsy Stamps &Wild orchid flowers, Copic markers, distress ink, Zva creative gems, Decorative Labels Eight spellbinders. Damn friend I love it, and great job on the faux stitching ... love it...and you entered in some challenges, awesome, you just missed our, it was Dies...oh well another time. This is a wonderful image, and I love how you colored her. Awesome flowers! I love me some flowers! Cheers! These flowers are beautiful! I love your Copic coloring- also the blinged out hair bows and bracelet! Thanks so much for playing along with us at Paper Playtime!